Do you want a unique statement that says everything you want in an engagement ring? It can be difficult to find just the right engagement ring in a jewelry store, where you may or may not have the option to design your own. Fortunately, there are a number of online jewelers that allow you to do just that — and often with a much greater selection of settings, precious metals, diamonds and other gemstones. There are a number of online jewelers that allow you to design your own engagement ring online, and it can be a fun process! Here, we’ll take you step by step through James Allen jeweler’s online design process to give you an idea of how it works. James Allen’s website has an enormous selection and excellent tools to help you make the best choice. To begin, click on “Design Your Own Engagement Ring” on the James Allen website’s main page. You can choose to start with the setting or the diamond. They also give you the option of clicking if you prefer a gemstone. We’re going to start with a setting for this tutorial. Click on the type of setting you prefer (Solitaire, Channel Set, Halo, etc.). Click on the type of precious metal you want, or you can click on “All Metals” if you’re not sure. Use the slide bar to set your maximum price (this is the cost of the setting only). Once you’ve chosen your search filters, scroll down the page, and you’ll see a number of setting photos based on your criteria. You can sort your results by bestsellers or price, and you also have the option of sorting by shipping date. Once you’ve clicked on the setting you like, the site will take you to the setting product page. You’ll also see the different precious metal options available for this setting. Selecting each metal will pull up a large photo of your setting in that metal. Click on the “Choose This Setting” bar, and a small menu box will pop up where you can click to proceed where you want to go next. We’re going with “Choose a Diamond” for our tutorial. Before we continue with our tutorial, it’s important to know about the diamond four-C grading system — color, clarity, cut and carat weight. This video by the Gemological Institute of America, which developed the universally used system, is an excellent resource and will help you choose the best diamond you in your price range. Click on the diamond shape you prefer (Round, Pear, Marquis, etc.). Slide the “Cut” bar to choose which diamond cut you’d like (ranges from Good to True Hearts). To choose your color, slide the bar to each letter grading (K through D). If you click on the question mark icon, a pop up window will tell you about each color choice. Choose your carat weight (ranges from .1 to 8). Select your clarity by sliding the bar to the one of your choice. Click on the question mark icon for a pop up window, which will tell you about each clarity grading. Use the slide bar to choose your minimum and maximum price range. Choose your diamond origin. The default is “All” or you can choose a “CanadaMark” diamond. Clicking on the question mark icon will explain the difference. Once you’ve chosen your search filters, scroll down the page, and you’ll see a number of photos of diamonds based on your criteria. You can sort your results by carat, color, clarity, cut or price, and you also have the option of sorting by shipping date. Click on the diamond of your choice. After you’ve clicked on the diamond you like, the site takes you to the diamond product page, where you can inspect the diamond from all angles. If you’re satisfied, click on the “Choose This Diamond” bar. Step 7: See Your Design! Once you click on the diamond of your choice (and you’ve already chosen your setting), the site will take you to the “Congratulations! Here is Your Design” page. Choose your ring size if you didn’t already do so when selecting your setting. Click “Add to Cart,” and you’ve just designed the ring of your dreams! Where Else Can You Design Engagement Rings Online? Why Purchase Online Engagement Rings? Tired of trekking to jewelry stores to find the perfect ring — and in your price range? Forget about it! You have much more selection with a surprisingly significant savings by going online. Even if you don’t want to entirely design your own ring, you can find a huge variety of engagement rings online. Read our article, Best Online Engagement Rings, to see your options and our recommendations. Did you or your fiance design an engagement ring online? Tell us your experience! 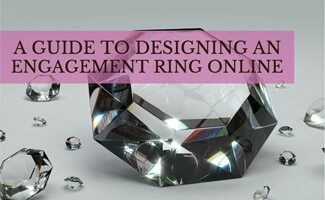 Thanks Sally for this handy step by step guide, to be honest I was really intimidated about how many options there are when designing an engagement right but this makes it seem super easy! I love the idea of making something unique so my fiance will feel like it was specially made for her!